Funding Needed for Emergency Alligator Rescue by International Reptile Rescue, Inc.
International Reptile Rescue, Inc. hasn't added a story. International Reptile Rescue is the oldest Reptile Rescue in North America. We are a 501 (c) 3 non-profit which gets called upon frequently for help and consultations. This is another one of those emergency times when your help is desperately needed. We have less than 30 days to get an alligator from Eastern Illinois before she’s euthanized. She was and still is being kept illegally. Her owner moved out of the rental and abandoned her. Upon entering the rental the owners found a big surprise, an alligator! As you can see in the picture the enclosure isn’t even twice her length and she can barely turn around in it. It’s about 2700 miles one way so 5400 round trip. On average van gets 20 mpg so that’s 270 at $4/gal (hopefully gas won’t keep going up) comes to $1080. Two motel rooms and food at $125/day for at least 6 days is $1500. All this comes to $2580. That doesn’t include extra if our van breaks down. Hoping the van will be running on prayers. Please visit our historical website www.internationalreptilerescue.com which has newspaper articles going back to the early 1970’s on us. Also visit our awesome FB page where we post rescues, updates and Events. If you’re a real animal lover beyond fluffy dogs and cats, then please consider a donation and helping with our travel expenses to bring her to a new wonderful home. ALL animals deserve love and respect. Rescue is truly a “team effort” and together we can save this beautiful alligators life. NO innocent animal should be “killed” due to irresponsible owners. Finding rescues new homes/foster homes as soon as possible is what rescue is all about. We already have a foster home waiting for her. Won’t you please donate, all we need is your help getting her here. International Reptile Rescue, Inc. hasn't posted any updates yet. 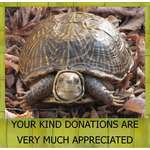 International Reptile Rescue, Inc. is managing the funds for this campaign.